This DVD is designed to help people who are about to have an angioplasty to understand what will happen. It takes viewers through being admitted to hospital, the angioplasty process itself, and what hapens once they go home. Those changes in lifestyle they may need to make, such as improving their diet in order to keep their hearts healthy are explained. 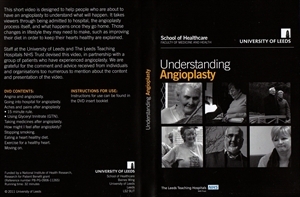 Understanding Angioplasty DVD single unit: £8.50 + VAT plus postage and packaging. For multiple copies or for delivery to other countries, please contact ennovations@medipex.co.uk. VAT: This product is taxable.